Sun Village was the first 55+ community in Surprise. It's also credited with the city's popular boom. The city of Surprise is in the Greater Phoenix Metropolitan Area in Arizona. It's 22 miles from Downtown Phoenix, and a 45-minute drive from Phoenix Sky Harbor International Airport. It owes its unusual name to Flora Mae Statler, who founded it in 1938 and named it Surprise because she said she would be surprised if it ever amounted to anything. It was incorporated as a city in 1960, but only started to develop in the mid-1980s with the arrival of the Sun Village community for 55+ active adults. With the development of other such communities, and the expansion of Phoenix, it has been one of the fastest-growing parts of the Phoenix area in the last 10 to 20 years. It now has a population of over 130,000 and is a bustling city in its own right. There is plenty to see and do in Surprise, including the Wildlife World Zoo, Aquarium, and Safari Park, the Surprise Tennis and Racquet Complex (one of the best in the U.S.), the Surprise Aquatic Center, and numerous golf courses. Hikers can enjoy the White Tank Mountain Regional Park, a beautiful mix of mountains and desert which forms the western edge of the city. Although at the time of writing Surprise has no hospital of its own, a new "microhospital" is scheduled to open in Spring 2020. It will provide 24-hour emergency care, a 13-bed emergency department, eight inpatient rooms, an operating theater, a pharmacy, and other services. Until it opens, the nearest hospital is the Banner Dell E Webb Medical Center, three miles away in Sun City West. The Banner Boswell Medical Center is six miles away in Sun City. Sun Village was the first age-restricted community in Surprise, begun in 1985 and completed 10 years later. It has 1,382 homes for 55+ active adults, divided into attached and detached homes. Attached homes range in size from 634 square feet, providing one bedroom, one bathroom, and a one-car garage, through to 953 square feet, comprising two bedrooms, two bathrooms, and a one-car garage. All detached patio homes have a two-car garage. The smallest floor plan is 1,168 square feet for a two-bedroom, two-bathroom home, going up to 2,106 square feet for a three-bedroom, two-bathroom home. Other models offer two bedrooms and a den/third bedroom. 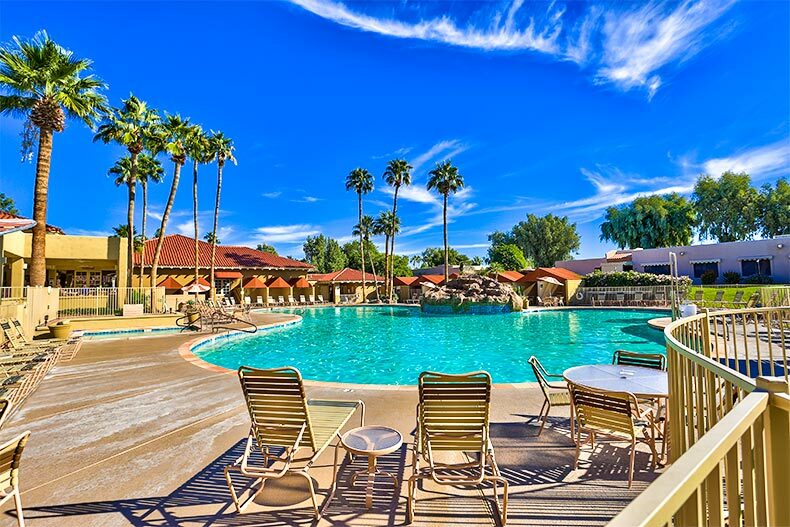 Amenities in Sun Village include a 47,000 square-foot community center, an outdoor pool and spa, a ballroom, several arts and crafts studios, two illuminated tennis courts, two pickleball courts, and four shuffleboard courts. In addition, residents can use the Sun Village Golf Course, which is an 18-hole public course within the confines of Sun Village, at discounted rates. The community has several dozen clubs and groups, including for most sports, card and board games, water activities, craft classes, movies, and a singles group. Sun City Grand was the second community to develop in Surprise and is for the 45+ active adult. Work on its 9,802 houses and condos began in 1996 and finished in 2005. Given its size, there are a large number of different models available. Condos start at 427 square feet for a one-bedroom, one-bathroom home with a one-car garage. The largest condos are 1,020 square feet with two bedrooms, two bathrooms, and a single car garage. Prices are in the low $100s, making for a low-price home near Phoenix. Single-family homes start at 1,096 square feet and go up to 3,388 square feet. All have either a two- or two-and-a-half-car garage. The more compact homes have either one bedroom and a den, and all have one-and-a-half bathrooms. There are many amenities in Sun City Grand, including four championship golf courses, two fitness centers, fishing lakes, hiking and biking trails, several swimming pools, tennis courts, pickleball courts, three restaurants, three snack bars, and the community runs its own TV station and publishes a monthly magazine. There's a club for almost every activity, including most sports, board and card games, wine tasting, dining, gardening, a singles club, dancing, stained glass, a veterans club, a Republican club, and a Democratic club. Arizona Traditions is the newest of the communities in Surprise, with 1,768 single family homes built from 1997 to 2013. It's a gated 55+ active adult community with homes that range in size from 1,052 to 2,319 square feet. All have at least a two-car garage, with some models having a three- or three-and-a-half-car garage. They also all have two bathrooms, with larger homes having two-and-a-half bathrooms. Smaller homes have one bedroom plus a den, with larger models having either three bedrooms or two bedrooms and a den. Amenities in Arizona Traditions include a 20,400 square-foot clubhouse, an 8,300 square-foot ballroom, an 18-hole golf course, three outdoor pools, four tennis courts, shuffleboard and pickleball courts, and several arts and crafts studios covering such activities as woodworking, sewing, ceramics, and stained glass. There are clubs for most sporting activities, for hiking, dancing, singles, poker and other card and board games, and there's a choir.